Creating corridors within Philadelphia neighborhoods to improve residents’ ability to travel by foot, by bicycle, and by public transit is the goal of our Safe Streets, Healthy Neighborhoods campaign. This campaign began in 2011 by studying South Philly with the Community Design Collaborative. 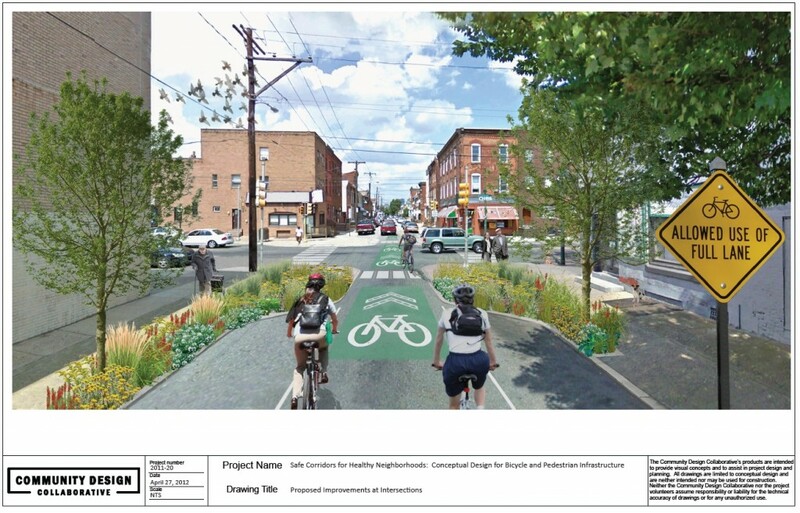 Late last month, the Philadelphia Streets Department was awarded $250,000 to create “Neighborhood Bikeways” on 13th & 15th Streets from South Street to Oregon Avenue. 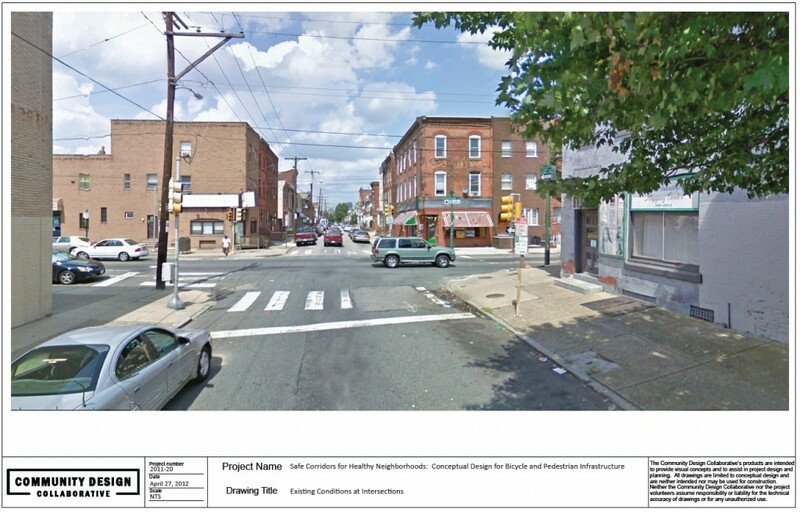 This grant is the culmination of three years of work on improving this corridor through South Philly. 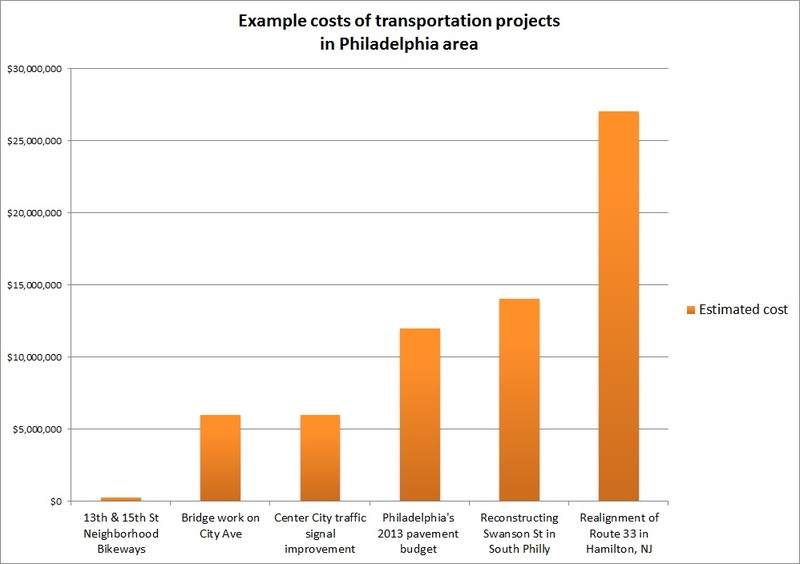 South Philadelphia has some of the highest rates of bicycling in Philadelphia. There is an immediate need for better facilities to accommodate all that bicycling because currently, bicyclists in South Philly share narrow roads through intersections with poor sight lines. 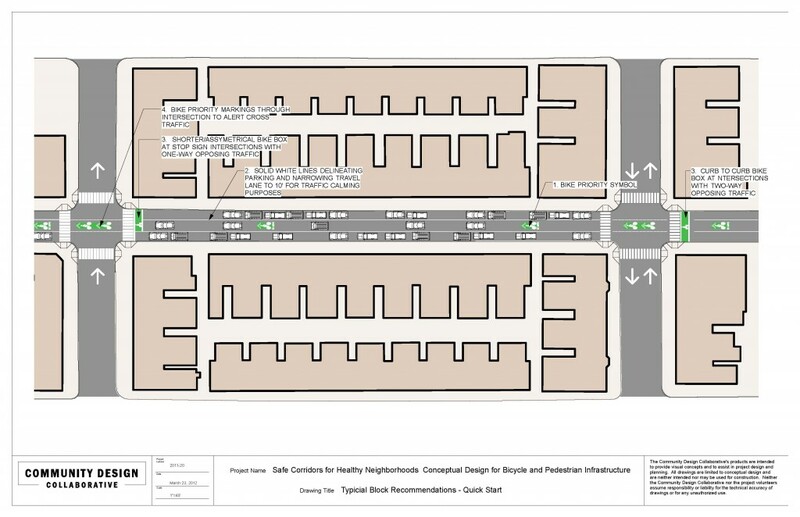 Although the City’s pedestrian/bicycle plan proposed “bicycle friendly streets” on either side of Broad Street between South and Oregon, that plan did not suggest in detail what a such a street would look like. An image from the CDC’s report depicting the current state of things. The short-term recommendations from the CDC’s report (click for bigger version). After the report was finalized, we convened a working group made up of staff from the Streets Department, the Planning Commission, the Mayor’s Office of Transportation and Utilities, and the Water Department. The group discussed the CDC report’s recommendations and which could be implemented. Once agreement was reached about the design elements that would constitute a Neighborhood Bikeway, we helped the Streets Department seek funding. The City’s paving budget is extremely tight and carving out funding for this project without outside funding was not possible. A rendering of the signs and paint the streets will receive through this $250,000 grant. The goal of these Neighborhood Bikeways is to draw bicyclists off Broad Street and other parallel streets. Attracting a large number of bicyclists to 13th and 15th will in turn change the culture of how people use these streets. Drivers in a hurry will come to expect high bicycle volume and, if they have a desperate need for speed, they will take another route. When bicyclists set the pace for travel, it calms the streets in a way that is safer for all users. Culture change is important. The infrastructure and environment on 13th and 15th Streets, to date, have encouraged a driving culture less hospitable to bicyclists and pedestrians. These Neighborhood Bikeways are Philadelphia’s first attempt at changing that culture. 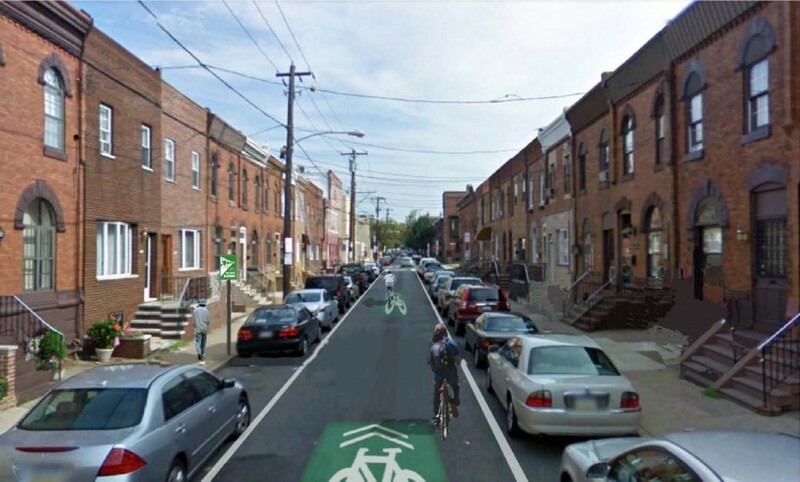 In researching how to make this South Philly corridor more bike-friendly, we looked for other American cities that had implemented bicycle infrastructure on streets with profiles similar to 13th and 15th Streets (23′ wide, parking on both sides). We found no city that had installed bike lanes on streets like these. Long term, we need north/south bike lanes through South Philadelphia. We need to create streets where bicyclists of all abilities feel safe taking the lane, where the culture does not encourage or tolerate drivers intimidating bicyclists onto the shoulder or the sidewalk. Getting there involves sincere neighborhood engagement, City Council backing, and more funding for the Streets Department. Those are three of the Bicycle Coalition’s biggest priorities for Philadelphia over the upcoming several years. Rendering of the CDC’s long-term recommendations. In the meantime, we will see how these treatments work. No matter the results, we will have learned something valuable. If 13th & 15th see a marked increase in bicycling rates, fewer pedestrians struck by vehicles, and fewer bicyclists using sidewalks (on 13th/15th but also on Broad Street), then Philadelphia will have discovered a cost-effective way to improve narrow streets. If this treatment does not meet those goals, we will know that more significant measures must be taken to make our streets safer for all users. Why this instead of promoting bicycling on Broad street by installing bike lanes there? How will the success of this pilot be determined? Anecdotally? Broad Street is a major automobile thoroughfare and is a very dangerous route for cyclists. Vehicle speeds are too high, and there’s a lot of double parking on Broad that would make bike lanes ineffective and dangerous. 13th and 15th experience much slower vehicle speeds at a pace closer to that of a bicycle, making it easier to share the road. The fact that there is only one travel lane also makes double parking on those streets not an option. Anecdotally I can say that 13th and 15th are much more comfortable and safe streets for biking than Broad, and I eagerly look forward to these improvements. However, the success of these pilots can be determined quite easily by collecting data: car and bicycle counts, travel speeds, and accident rates. If bicycle counts go up, cars move at more reasonable speeds, and accidents go down, it can be considered a success. Great, more paint for drivers to ignore. The reason cyclists ride on Broad Street is the same reason cars use it: it’s the major thoroughfare and that’s where everything is! Telling cyclists to go somewhere else is not the answer. What’s next, tell cyclists to stay off Market and to use Wharton instead? This is a waste of money that could be better spent encouraging more cyclists to join us, rather than segregating cyclists. Kudos, however can’t help wondering why not make use of Broad St’s width for dedicated bikelanes. Sharrows and signs only calm traffic slightly. Agree with the comments on Broad St, although 13th and 15th are only a block away. Would like to see accommodations on corridors between Columbus and 13th also. And when is there going to be some kind of bicyclist/motorist communication about those sharrows?